This Father’s Day, win him over with a delicious recipe that’s sure to make the usual fare pale in comparison. 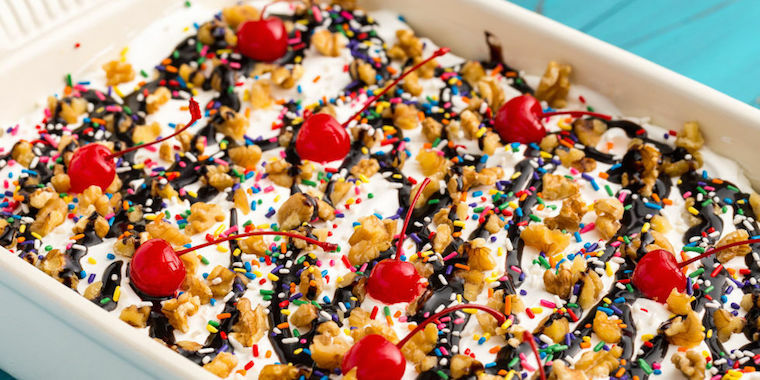 Whether he gets all fired up over the grill or has a serious sweet tooth, he’ll love these mouth-watering dishes—and you’ll love flexing your culinary muscles in his honor. Check out these Father’s Day recipes below! Who needs to go camping to enjoy s’mores? 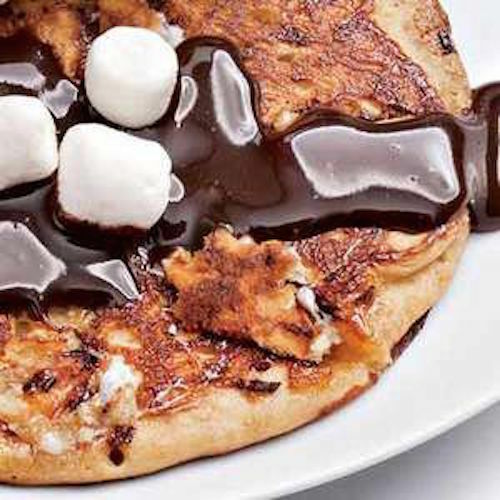 All you need to prep these crazy-good pancakes are graham cracker crumbs, mini marshmallows, and hot fudge. You could whip up the pancakes from scratch, but don’t feel guilty about dressing up the frozen variety in a pinch. 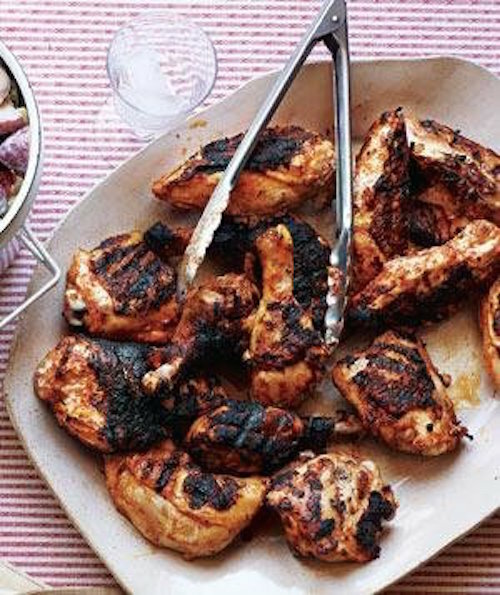 If dad doesn’t mind a little heat, this seriously flavorful chicken dish will spice up his special day thanks to the addition of paprika, salt, and black pepper. Add a side of rosemary potatoes and you’ve got the perfect meal for a meat-and-potatoes kind of dad. Sure, he loves a cold one—but that’s so predictable, don’t you think? 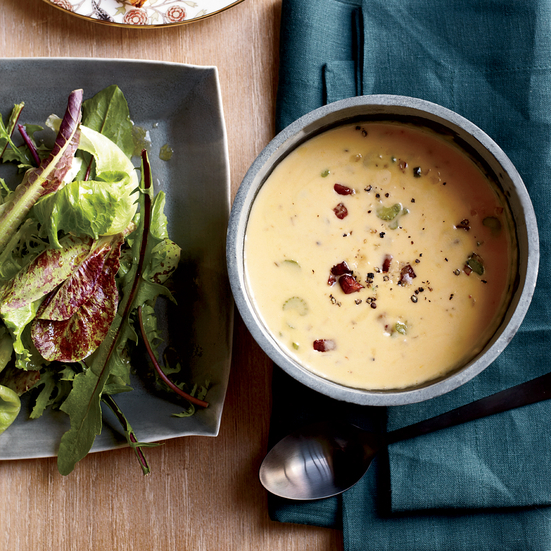 Surprise him with a bowl of this rich soup, instead. It’s got everything he loves: cheese, bacon, beer, and some tasty seasonings to bring it all together. Did we mention the bacon and beer? Yes, it’s OMG-worthy—and it’s also no-bake, easy to prepare, and fun for the entire family. The beauty of this “lasagna” is that it can be customized with his favorite fruits and toppings for a truly unforgettable dessert. For the vegetarian dad who prefers celery to chicken and tomatoes over tacos, this flatbread pizza is sure to be a smash surprise. 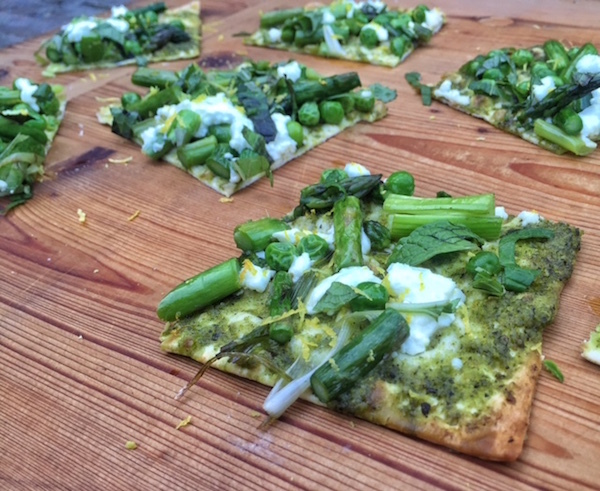 It’s loaded with green goodness, from unexpected peas and asparagus to pops of deeply flavorful pesto and mint. Is dad more of a workout fanatic? 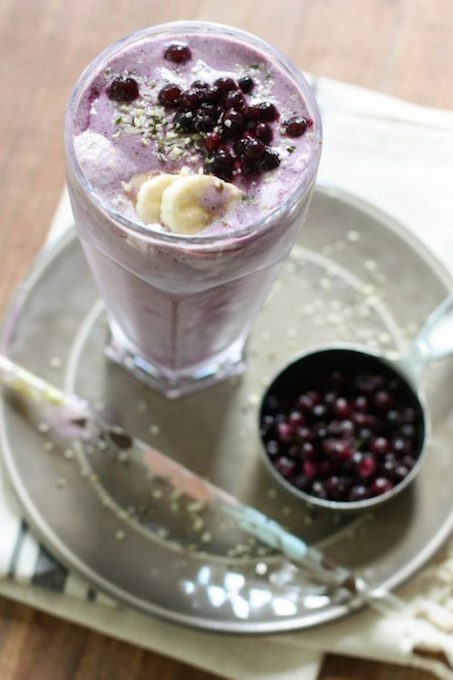 He’ll love the thought you put into concocting this protein-packed smoothie, which is designed to energize his workout and satiate his appetite first thing in the AM. Feel free to garnish with his favorite nuts for an attractive finishing touch. Speaking of breakfast, who doesn’t love waking up to the smell of something delicious in the kitchen? 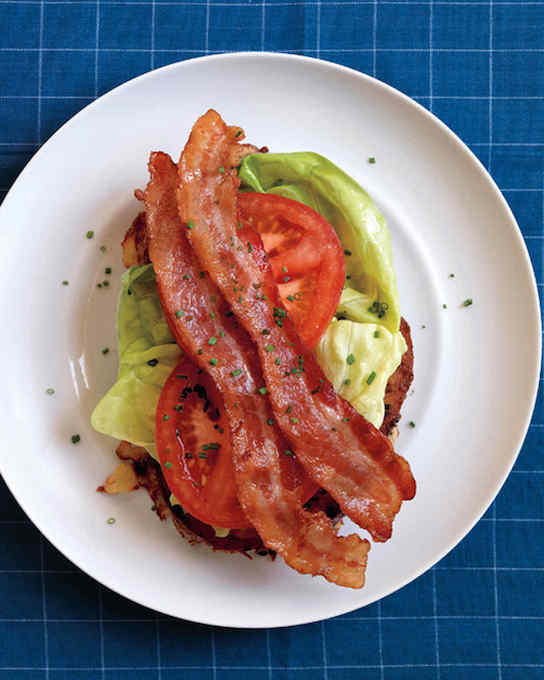 This open-faced sandwich ought to do the job—it’s piled high with crispy bacon and finished with chives. The frittata is one of those reliable dishes that is absolutely perfect at any time of the day. If you’re hosting brunch at home, this is practically a must—but he’d also love it for breakfast or a mid-day snack. 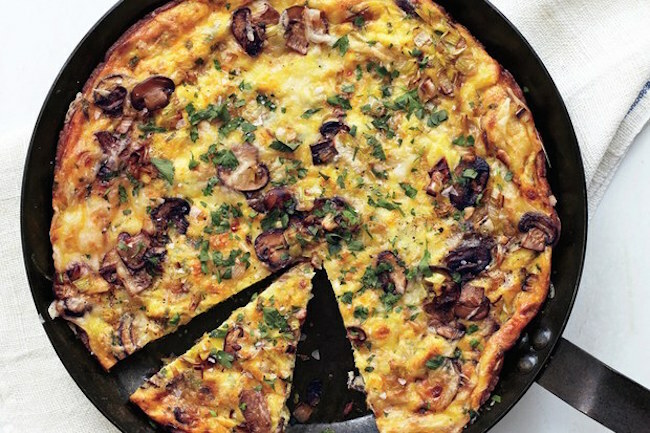 Basically…anytime is frittata time. When you’re done making these Father’s Day recipes, be sure to give him a gift he’ll love. Mother’s Day is right around the corner, and one of our favorite ways to celebrate is with a Mother’s Day brunch. Whether you’re having a brunch time party for the whole family, or keeping things small and simple, these sweet and savory recipes will turn Sunday into a real celebration. Take your rainbow, tie-dye, or unicorn obsession to the next level with these super fun cinnamon rolls. 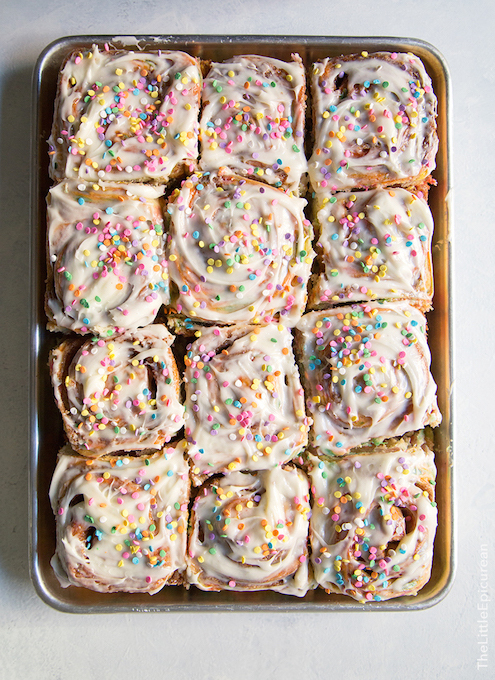 These ones are completely made from scratch, but you could totally upgrade store-bought cinnamon rolls with colorful icing and rainbow sprinkles. 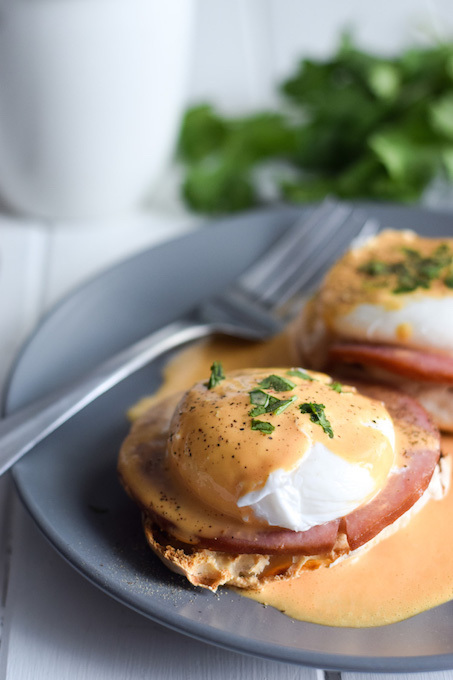 Put a spicy twist on a brunch classic with chipotle peppers and a lightened-up hollandaise sauce. Double this recipe to feed a family of four, and serve with fresh fruit, home fries, and plenty of coffee. Depending on how many people you’re hosting, this could be a side dish or a main course. 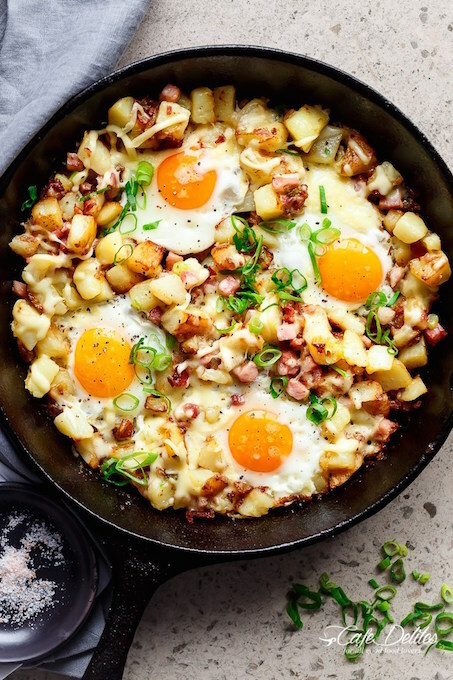 This sizzling hash skillet takes just 30 minutes to make, and you can never go wrong with bacon, potatoes, eggs, and cheese. 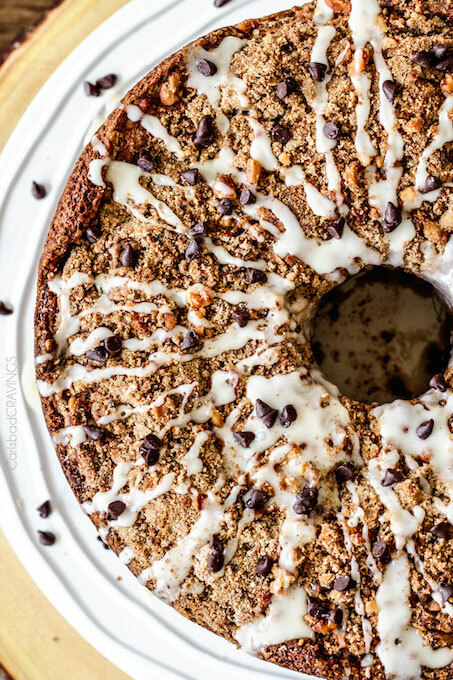 This sweet breakfast treat combines two of our brunch favorites: coffee cake and banana bread. Cream cheese keeps this cake super moist, and lots of icing and chocolate chips make it more like dessert than breakfast–not that we won’t be serving this at our Mother’s Day brunch. Burrata is an ultra-creamy cheese very similar to mozzarella, and it’s super indulgent flavor makes it perfect for a celebration like Mother’s Day. 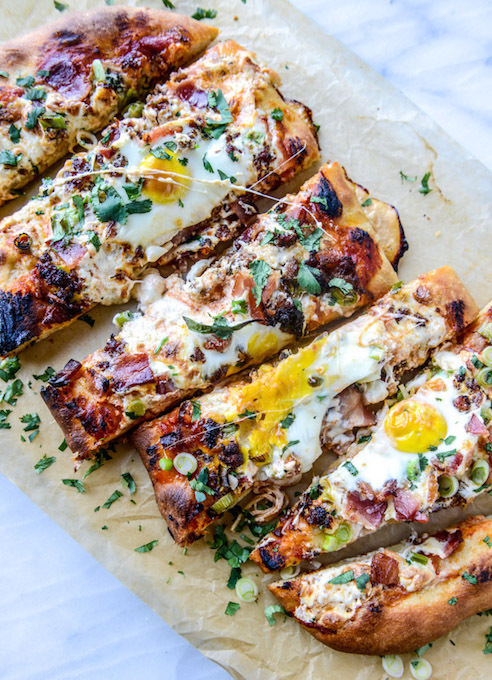 Use it as a topping in a savory breakfast pizza along with bacon, sausage, eggs, tomato sauce, and lots of herbs. Instead of flipping pancakes for the whole family, keep things simple and make a giant pancake (or two) in a skillet that everyone can share. 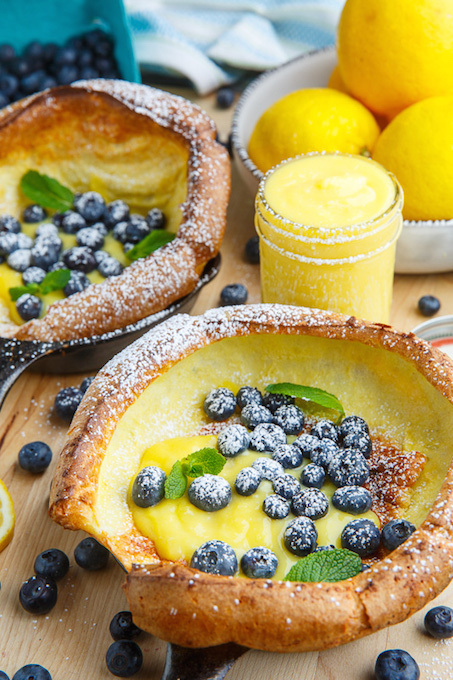 Top with tangy lemon curd and fresh blueberries for a perfect springtime brunch entree. Upgrade a childhood favorite by turning flaky croissants into caramelized French toast. Top them with plenty of fresh berries, and make sure to pour mom a mimosa. 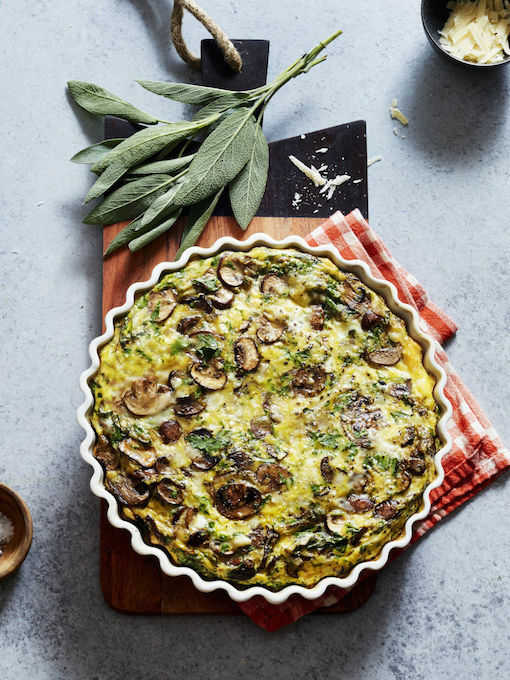 Mom will be super impressed with this elegant frittata–and if you’re hosting a crowd for brunch, turning eggs into a one-dish casserole is the easiest way to serve everybody. 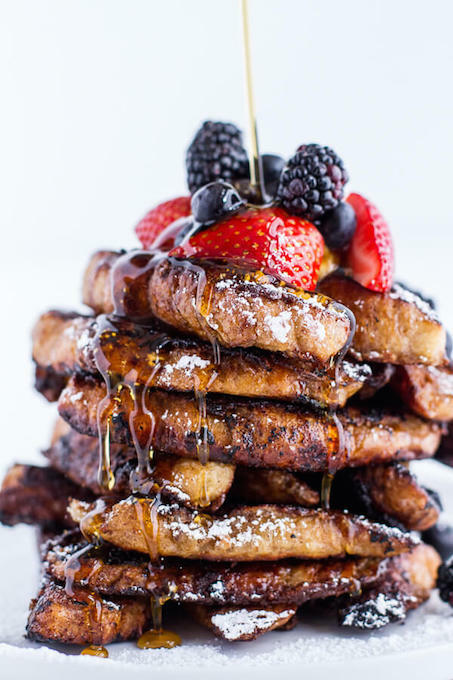 Are you drooling yet over these Mother’s Day brunch recipes? After you’re done cooking in the kitchen, give her a gift from our online boutique! Candy-filled baskets aside, Easter is all about sweet treats. Whether your usual recipes are full of springtime fruit or you prefer something traditional, like carrot cake, these 13 Easter desserts are perfectly festive for any Easter party. From gluten-free blondies to super fun “dirt” cups, these recipes will sweeten up your Sunday holiday. 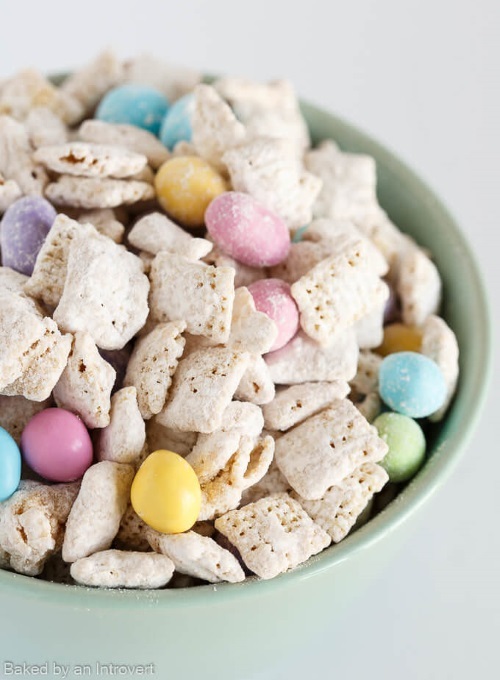 A super simple, super delicious Easter treat that your guests won’t be able to get enough of. 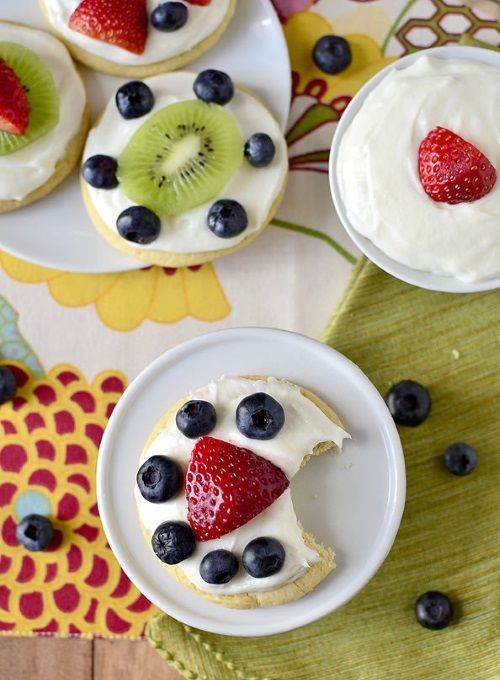 Show off your favorite fruit with these two-bite dessert pizzas. These ones have mixed berries, but we think sliced kiwi or banana would also be super delicious. The marshmallow creme has just two ingredients, so if you need a crowd-pleasing dessert in a pinch, this recipe is perfect for you. Keep your diet on track and combine two classic desserts with these chewy bars. Part carrot cake, part blondie, this recipe uses healthy ingredients like flax meal, coconut oil, and avocado–and plenty of yummy things like cinnamon and pecans. 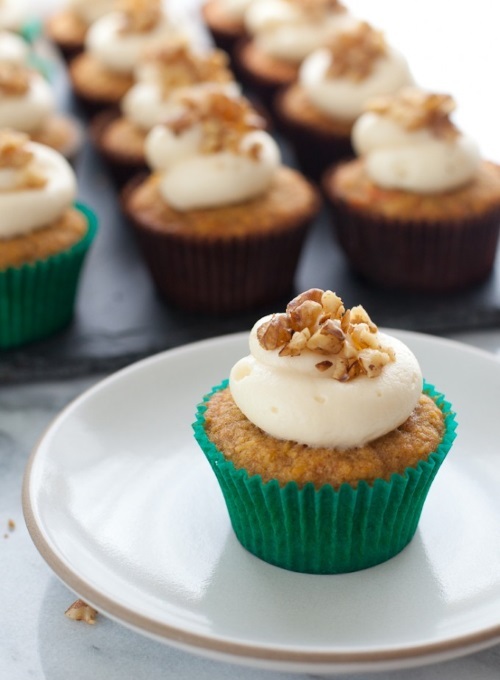 Even the Easter bunny will approve of this carrot-filled treat. 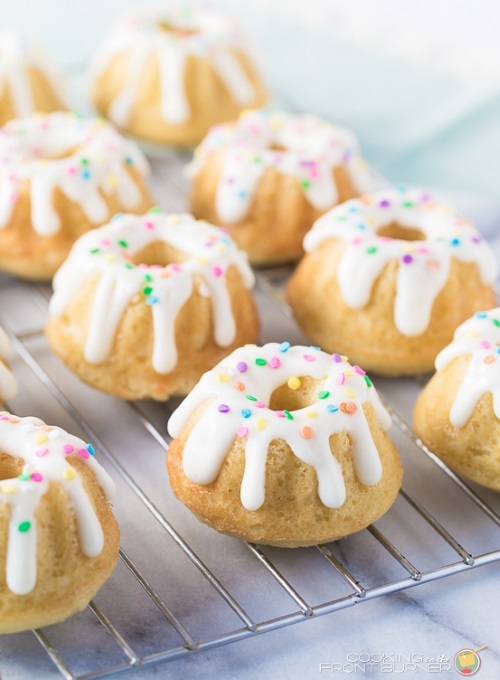 Citrusy desserts like these cute bundt cakes are perfect for Easter. Vanilla yogurt makes these cakes soft and dense, and a simple cream cheese icing gives them the perfect finish. Top with colorful pastel sprinkles for a cheerful dessert. 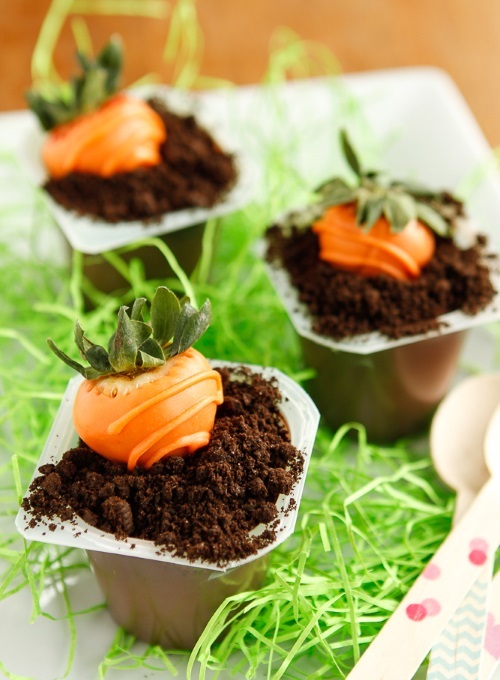 Perfect for any Easter party, these festive dirt cups get a springtime twist with strawberry “carrots” and chocolaty Oreo “dirt.” These desserts are super easy to make and only have four ingredients! Let the kiddos help out in the kitchen with this sweet snack! Chex, white chocolate, pastel peanut M&Ms, and peanut butter make this a sweet and salty mix that’s seriously addictive. We love how it’s packaged in Mason jars here for a sophisticated twist. 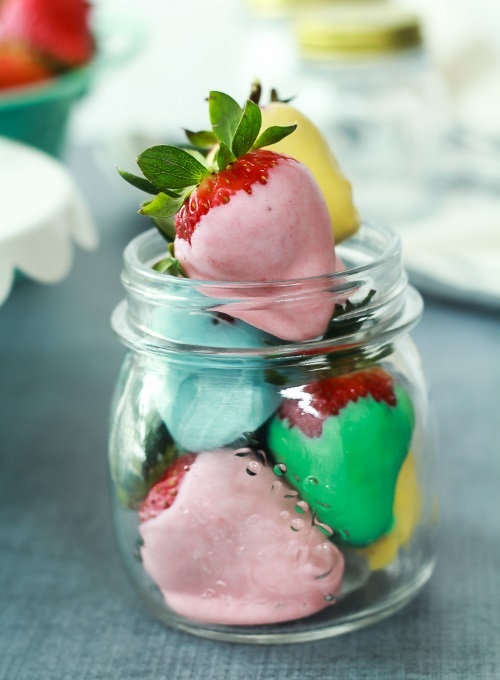 Turn healthy strawberries into a perfect Easter treat with help from white chocolate and a little bit of food coloring. We love these pastel berries, and think they would be even cuter with some sprinkles. 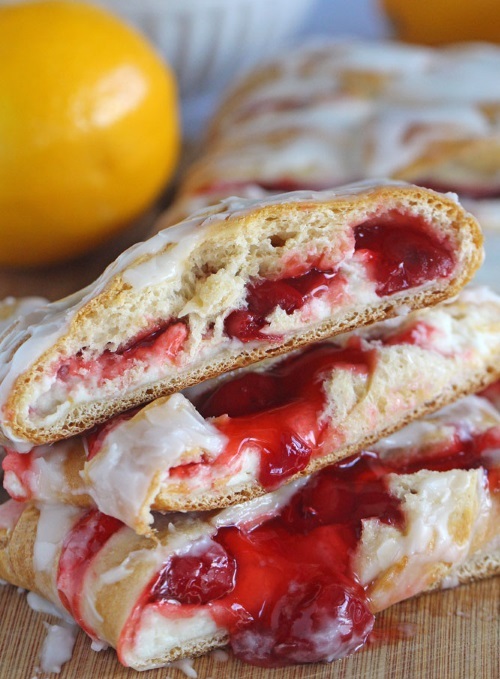 Fabulous for Easter brunch or dessert, this gooey cheese danish tastes even better than it looks. Pre-made puff pastry and cherry pie filling make this recipe a breeze, and the whole family is sure to love it. The next on our list of Easter desserts? 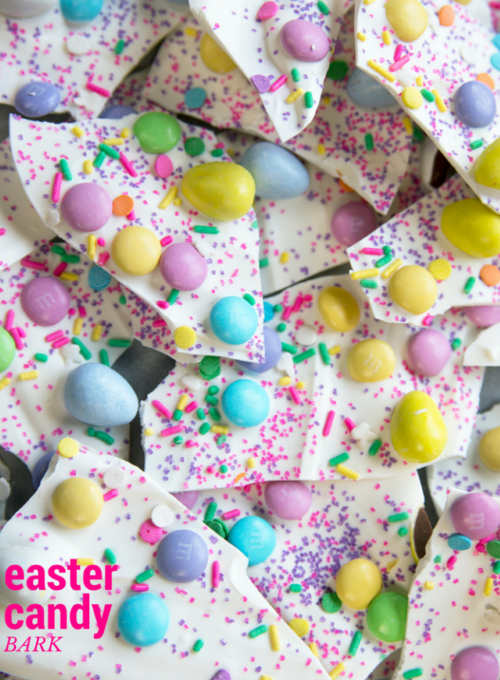 This festive bark is the perfect way to use up leftover Easter candy! 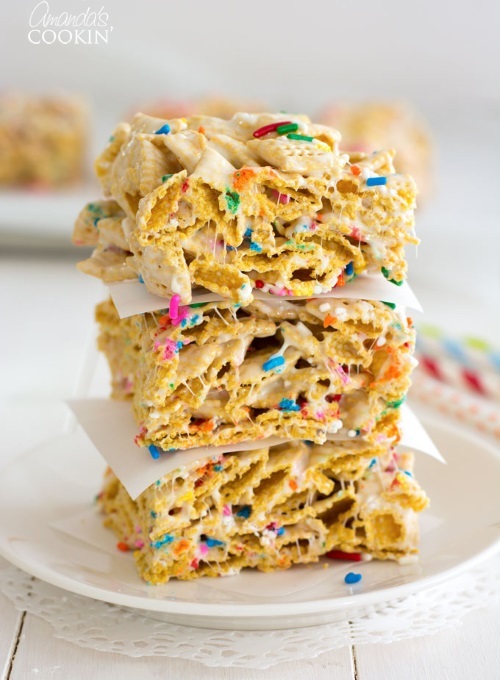 With a base of white candy melts, you can add in all the sprinkles and M&Ms you like. Put an Easter twist on cereal with these sticky, sweet dessert bars. Made with just five ingredients, these no-bake treats can be made in a pinch–and everyone in your family will love them! 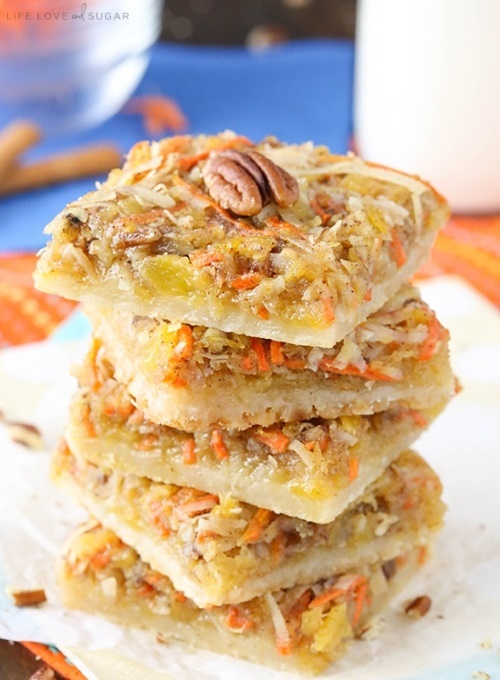 Simplify traditional carrot cake with these delicious shortbread bars. Made with the Easter bunny’s favorite ingredient (carrots! ), coconut, pineapple, and pecans, these gooey treats are great for any occasion, but especially Easter Sunday. These moist, fluffy cupcakes are made with chestnut, oat, and rice flour to keep them gluten-free. Everyone can enjoy these classic cupcakes, complete with a super creamy, honey-infused frosting. Put a twist on this traditional treat with an indulgent, dense pound cake that gets plenty of flavor from spices like cinnamon, cloves, and nutmeg. 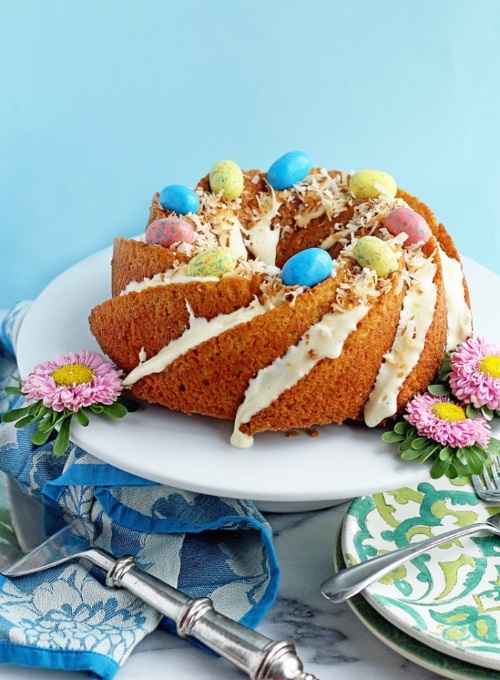 We love how this one is garnished with speckled candy eggs, coconut flakes, and cream cheese glaze for a festive finish. 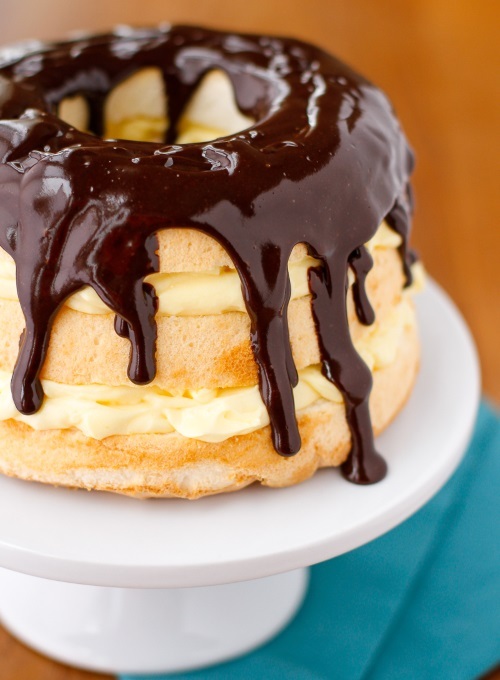 Is your mouth watering yet over these Easter desserts? To make your holiday even more fun, be sure to check out our free printable Easter Scavenger Hunt and Easter Egg decorating ideas. And for cute Easter decor for your home and table, check out our site.